“My Centurion D5-based sliding started packing up on Friday. Over the weekend it mostly worked but would stop every now and then. It looked like it was pulling heavy. Come Monday morning and it didn’t want to open at all. 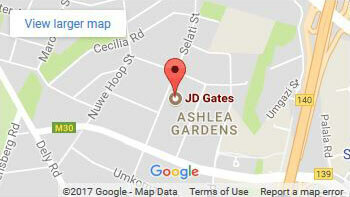 Phoned JD Gates and asked them to come and look. At first the lady said they can come tomorrow but at my hesitation she said ok they would come today. The guy phoned me around 15 minutes before he came and confirmed that he should came. Pitched up and had a look at the motor. Checked the battery and other tests and suggested a battery replacement. Then checked the wheels of the gate and said the bearings probably seized as it was rolling to heavy. He then told me upfront what a wheel and battery replacement would cost and proceeded to repair the gate right there and then when I accepted. Replaced the wheels by removing the existing pins (and grinding where necessary). Afterwards welded and painted everything again. The whole process took about an hour and my gate is running smoother than ever. The guys were friendly and they had everything they needed to do right here on the spot from the point the arrived. I had another guy do a quote earlier this morning and while I’m still waiting for the quote, JD Gates had already fixed the gate.